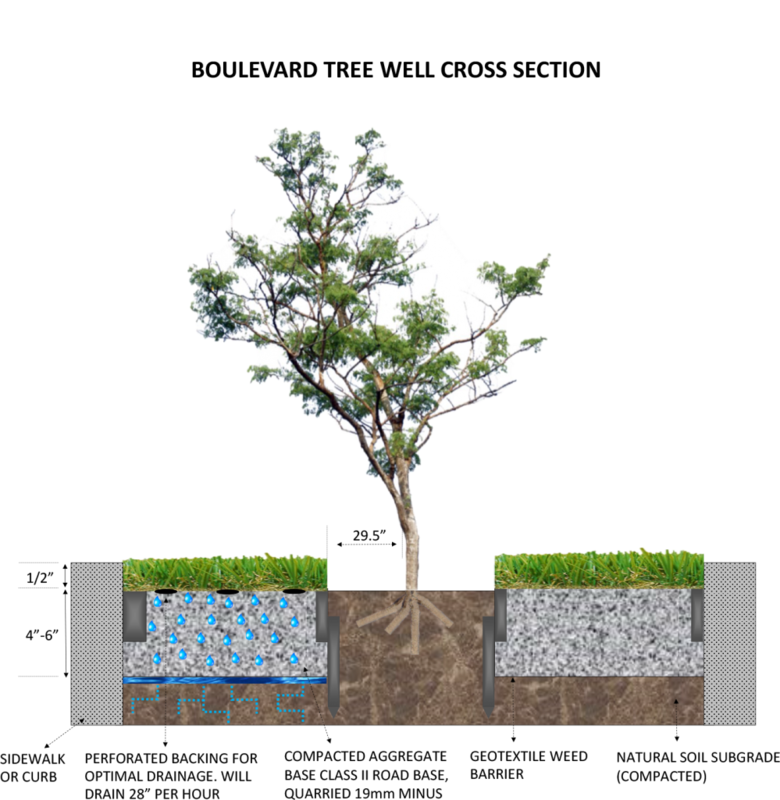 We take pride in each and every project, and stand by our work. 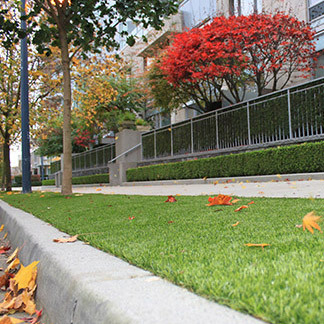 Precision Greens takes pride in every project. 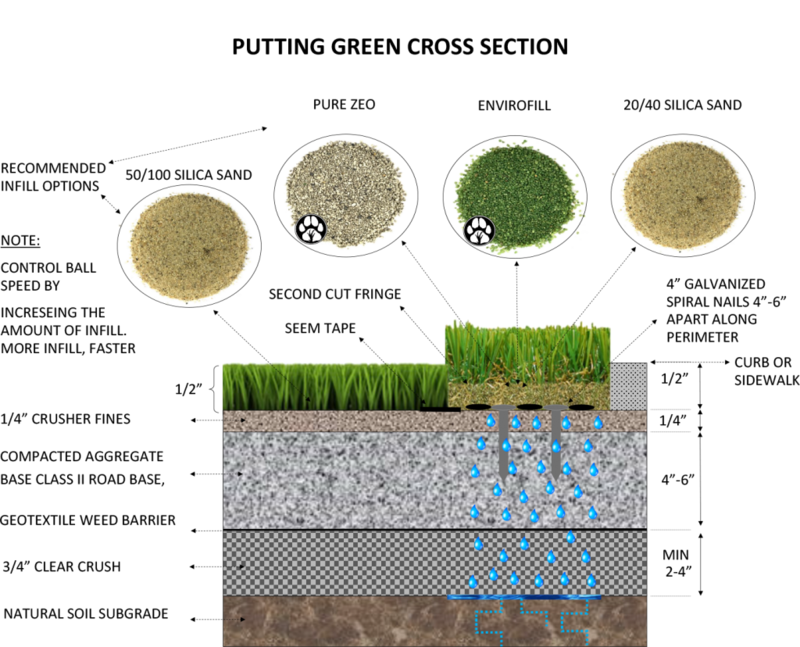 Learn our process below so you know what to expect with your Precision Greens installation. 1. Job Site Set Up – After a thorough understanding of your needs has been obtained by our sales person, we will establish a start date for work to commence. 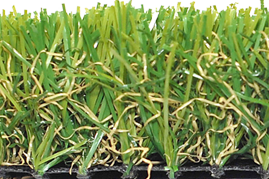 On that day you will see a Precision Greens vehicle arrive on site with a 3-4 person Project Team. 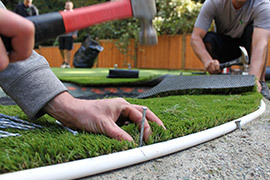 At this time, you will see your front yard and lawn protected where necessary by sheets of plywood. Tools will be put in place and a comprehensive review of the project, led by your experienced Project Manager, will take place. Some communication will take place with the sales person and/or home owner as needed and the crew will proceed with full confidence. 2. 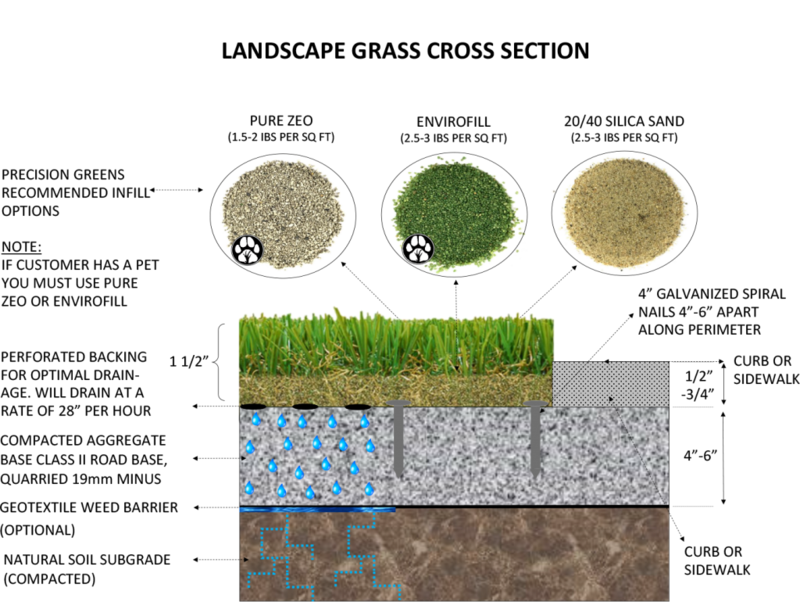 Excavation (Soil and Sod Removal) – Our sales team will have determined your excavation needs based on our Soil Density Test conducted during their initial visit. 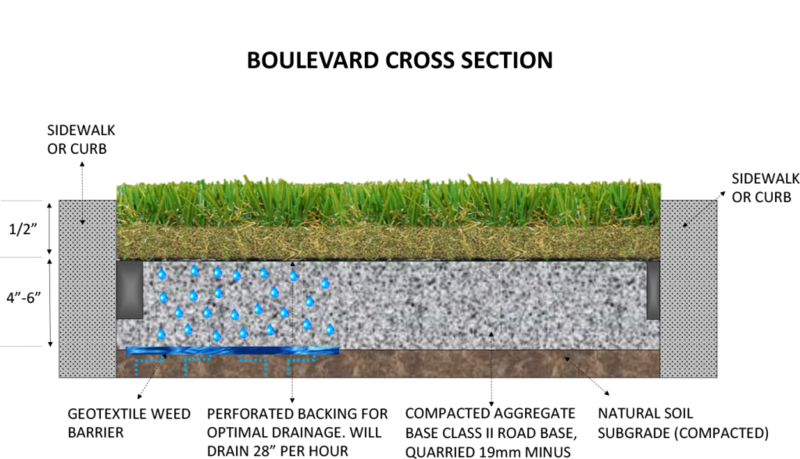 This determines how much soil and sod will need to be removed to allow for a strong yet free draining project area. In most cases you will see an “excavation bin” arrive on site the morning of. The bin will be filled with the goal of having it removed before the end of the day, while having all visible signs of dirt cleaned up at the end of that working day. 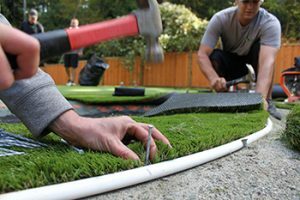 Our installers take great care to protect your existing yard, home and landscape and will take every precaution necessary to leave your home and garden in as good or better shape than when we arrived. 3. 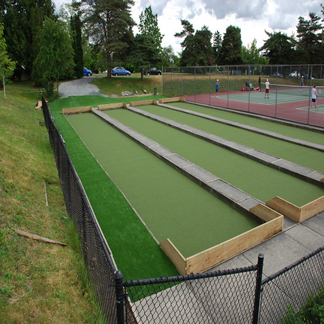 Base Construction – Although each base build is different depending on whether it is a golf green or lawn and depending on soil type and other drainage factors but, the general process is the same. 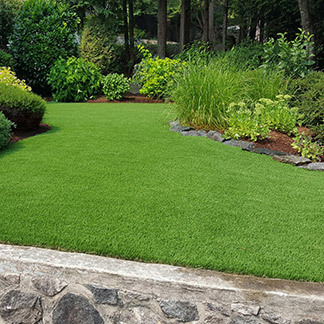 Precision Greens will bring the required quantities of gravel to your home or job site the day of the base construction with the goal to have it safely transported via wheelbarrow to the project area before the end of the working day. The gravel pile will be safely marked with cones during the transportation period and a full site clean-up will take place after the last of the gravel has been moved. 4. 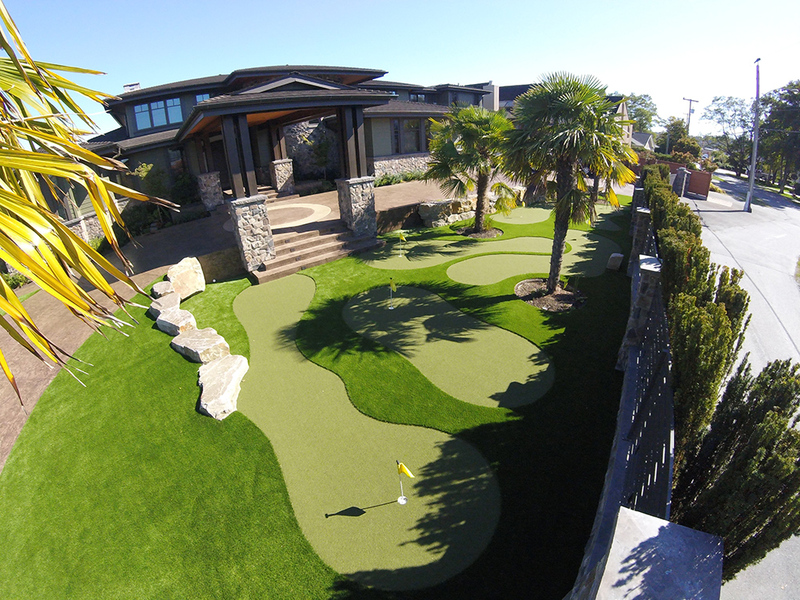 Synthetic Turf Installation – This is where we can only tell you so much without giving away our trade secrets! 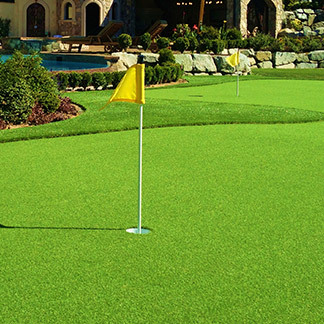 That being said, what we can tell you is that your Precision Greens Team will arrive on site in one of our installation vehicles and all the products and supplies required for installation. 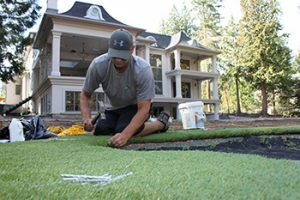 After taking another very close look at the base build, your Project Team will study the Turf Plan designed for your project and move to execute the installation. 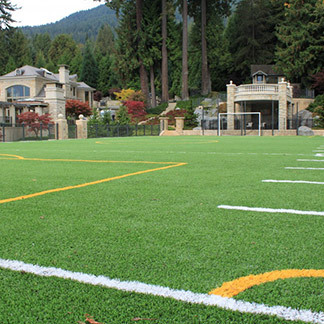 Your Project Team is trained to recognize perfection in every facet of installation. From the cutting and seaming to fiber infiltration to all of the important finishing touches, it is Precision Greens high level of workmanship that rewards us a reputation for excellence. This measure of excellence is why everyone at Precision Greens comes to work each day with pride- recognizing that we are good at what we do, and we love doing it. 5. 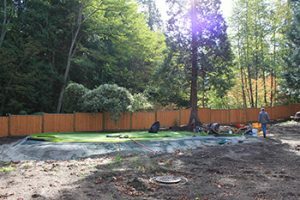 Site Clean-Up –Once the installation is completed, we will perform a thorough cleanup of the site, making sure everything is as clean or better than we arrived. 6. 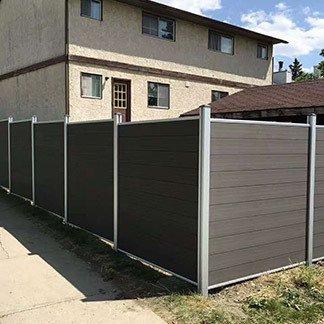 Follow Up – Your Sales Representative or Project Manager will walk you through the installation, and will happily address any questions or concerns you might have. 7. 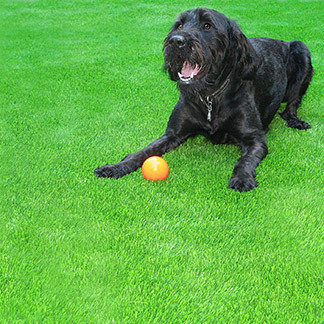 Continued Customer Care –Precision Greens offers continued maintenance for your artificial lawn or putting green, if required. More information on our customer care program here. It would be an honor to earn your trust. It would be an honor to build your Paradise.